Starting in his early teens with a construction company learning multiple trades, Gerald has acquired over 23 years of construction industry knowledge including plumbing, electrical, framing, roofing, tiling, concrete work and landscaping. He received 2 diplomas as electrical technician and electrical technologist specialising in control systems from Georgian College of Applied Arts and Technology. While attending College, Gerald also worked for Vaughan Hydro. During this time he gained relevant experience in transmission line design, subdivision power design and AutoCad drafting. After College, Gerald entered a full time position with Paragon Engineering for 7 years. Daily tasks included working on the design, project management and construction of roads, water & sewer lines, water catchment plans and subdivision layouts. 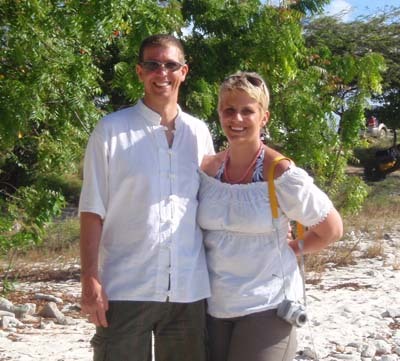 Through his years of experience, Gerald is familiar with Canadian building codes and has spent the past 6 years researching the construction practices of Bonaire and other tropical locations. With his support and knowledge the construction team in Bonaire will be well prepared to build your Bonaire investment not only to the required code but beyond. A self proclaimed perfectionist, Gerald believes in getting the job done right the first time. Amber Huppertz has over a decade of construction management & design behind her. Completing the four year course in three years, she graduated with two diplomas in Architecture with honors. After working with Komen Contracting Ltd and Troy Life & Fire Safety Ltd for the past 13 years, Amber is well versed in the building code, can work with any version of CAD, and has vast experience in designing layouts for commercial, retail and residential developments. Through strong organizational skills and excellent communication skills, Amber is able to keep a team of construction personnel efficiently scheduled and ensure the materials are onsite when needed. With many years in a service oriented industry behind her, she understands the need to clearly communicate proposed schedules for inspections, service and repairs. For the last 6 years, she has specifically been studying Caribbean (hot weather) and green building designs. The designs will utilize wind, solar and thermal properties to assist in heating, cooling, water catchment and recycling. Amber has a great ability to troubleshoot and resolve issues. She has a methodical approach to documenting and identifying problems ahead and coming up with long term solutions. These abilities have been kept sharp with practice at work and are vital when working in construction management.